The ZX is a versatile, modular approach to a production recording and playback server that lets you choose from an unrivaled selection of Cinedeck advanced software tool sets and powerful hardware configurations. Now you can cost-effectively custom-build a workflow workhorse that meets your specific ingest, playback and transcoding needs for 4K, UHDTV-1, 2K, HD and SD. Cinedeck RX2 is perfect for environments where space and weight is at a premium, and when cooling and power draw are of utmost importance. All the connections are designed with protection and accessibility in mind. Like it’s predecessor, the RX2 provides a full-featured UI in a conveniently small package. cineXinsert for Mac OSX is Cinedeck’s stand-alone, file-to-file insert edit application for installation on your Mac. cineXinsert is a groundbreaking NLE companion application that shaves hours off the time spent making changes. Start saving time and money now, with a tool that will accelerate your post workflow immediately. no need to re-export the entire program. 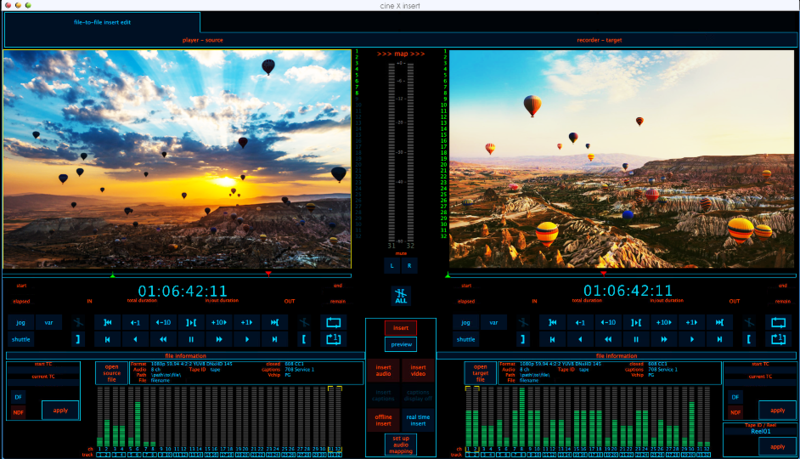 cineXtools is Cinedeck’s stand-alone, file-to-file insert edit application. The core module, cineXinsert, is a groundbreaking NLE companion utility that shaves hours off the time spent making changes. Simply change a shot, audio stem or replace a frame with a bad pixel in seconds instead of re-exporting the entire show. With additional modules for audio versioning, DPP metadata management and adjusting timecode, you can start saving time and money now, with a tool that will accelerate your post workflow immediately.